IS PEACE WITHIN THE STORMS OF LIFE EVEN POSSIBLE? Most of the time these life-changing events happen to other people. We see them on the nightly news or trending topics on social media. But what happens when those other people become you? How do you respond when the storms of life crash upon your perfectly scheduled dreams? This true story of life aboard a sailboat in the Florida Keys takes the reader on a suspenseful adventure of riding the ocean waves as a husband and wife pursue their sailing school dream. In the moments of a sunset, TRAUMA hits them not at sea, but on the coral gravel of the roadside. Captain Ana Donovitch shares the dissonant whispers we all have inside of us when we face life-threatening winds. For those struggling to change the direction of their lives, whether in calm times, or rough waters, Ana’s story inspires hope, humor, and the realization that no matter what the circumstances, we always have a choice. 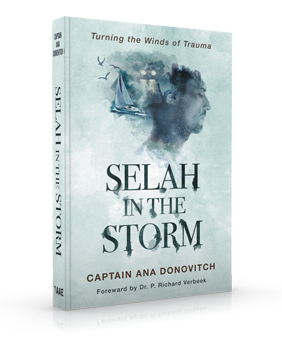 Selah in the Storm reveals the complexity of trauma, and how to support loved ones and friends who are in the midst of recovery. Ana’s story serves as an encouraging guide in a season of crisis. Her painful season of love, perseverance, and faith provide a compelling reason for examining ones own existence—and embracing a newly defined life. Adventurous souls ride the currents—the connection between lessons learned in the sport of sailing, and lessons learned in challenging seasons of life. Ana Donovitch’s desire is to help others connect to the whispers of their souls. In our fast moving world, she believes people need more time to “Selah,” to pause, reflect and honor their aspirations. Her teaching career has impacted employees, managers, and leaders at corporations and non-profits. 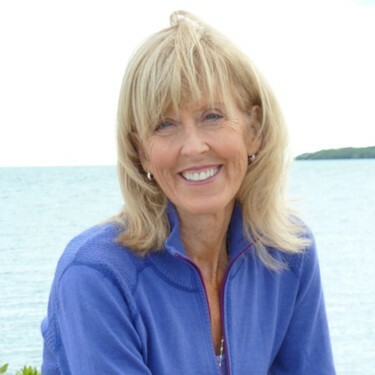 Through her writing and coaching, she has created learning moments for many on land and sea. Ana decided late in life to follow her heart along with her husband’s support. The two of them marked out a two-year business plan and successfully transitioned from corporate day jobs to a dream lifestyle of living aboard a boat and teaching others to sail. She is the founder of Selah Time, whose purpose is to help others pause and reflect on how they live their life and passions, discover their purpose, and set a new course that fulfills. Ana and her sailor-husband reside in the Midwest, close to family, friends, and big bodies of water.